QD-Loop rapid dilution device is and all-in-one sterile system for accurate and convenient volumetric dilutions. An accurate calibrated loop comes attached to a reservoir where patented Snap-Valve technology hold 1.0 ml of Butterfields of Maximum Recovery Diluent (MRD) buffer. 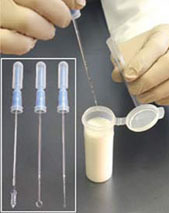 Simple breakt the Snap-Valve after a sample is collected and immediately a dilution is obtained that can be poured onto dry media film or streaked onto an agar plate. QD Loop comes in 1:10, 1:100 or 1:1000 dilution formats. 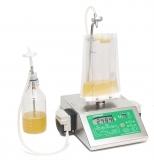 The all-in-one system allows the making of dilutions quicker and more convenient.